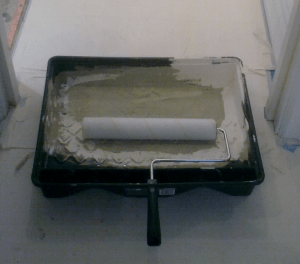 In my opinion, this is the “best kit for painting walls and ceilings” I recommended it at the Tried and Tested stand at the July 2011 TDS Trade Show, and updating this article in 2014, still this system holds up. It really is a high quality no-brainer setup for painters who just want kit that works without too much over-thinking and mixing and matching. 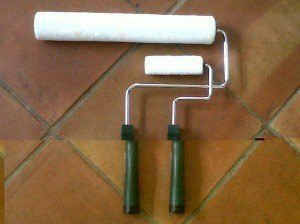 DIY painter? I would also recommended most of this kit too. 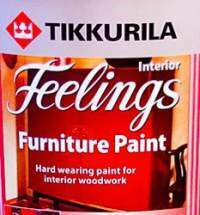 It will last you your DIY lifetime and because it works seamlessly, may save a few arguments at home as well. So read on if you need to know more! They do an 18″ industrial frame, but as an introduction to Wooster rollers, I would suggest the 14″ frame. 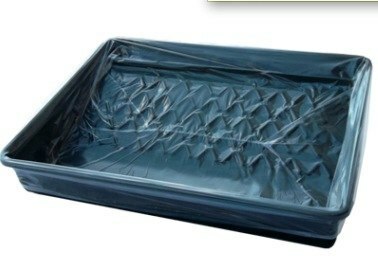 It is lightweight and as manageable as a 9″ frame, with much more coverage than a 12″. One of the many outstanding aspects of this frame is that you can cover huge areas AND roll really close to ceiling edges without missing a beat. Despite an arm on one side only, the frame is rigid. Not as super tough as a double arm frame, obviously, but I have never found it too flexy or prone to misbehave, even when pressing hard to squeeze out that last bit of extra paint. There are loads of neat design features that make this Wooster roller kit as good as it gets. Roller sleeves slide on easily, but the auto lock gizmo means that sleeves can’t slide off in use. 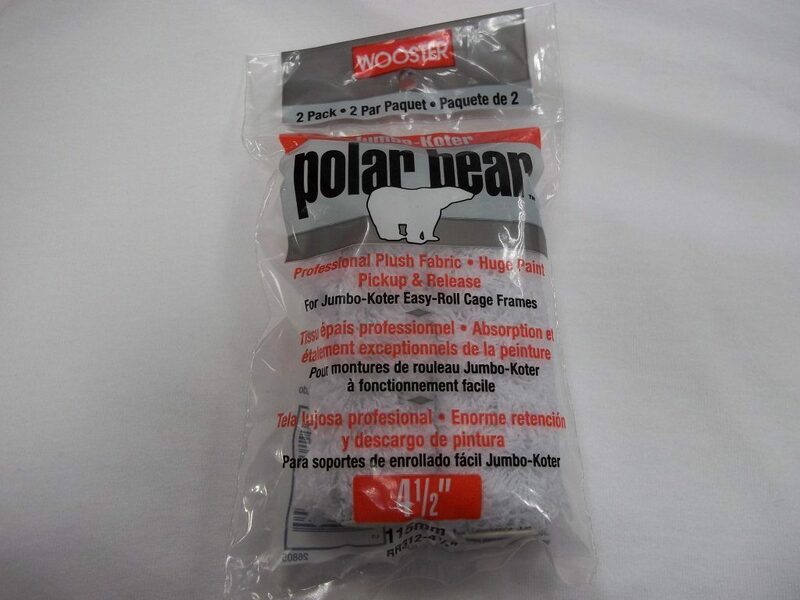 When you are finished, a short sharp knock against your pole releases the gripper and the sleeve slides off into your awaiting plastic sleeve. Wipe the ends clean, next colour, please! 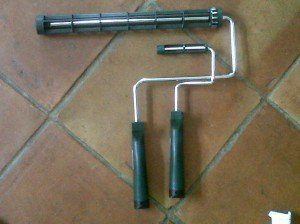 The Jumbo Koter is virtually a mini version of the big rollers. 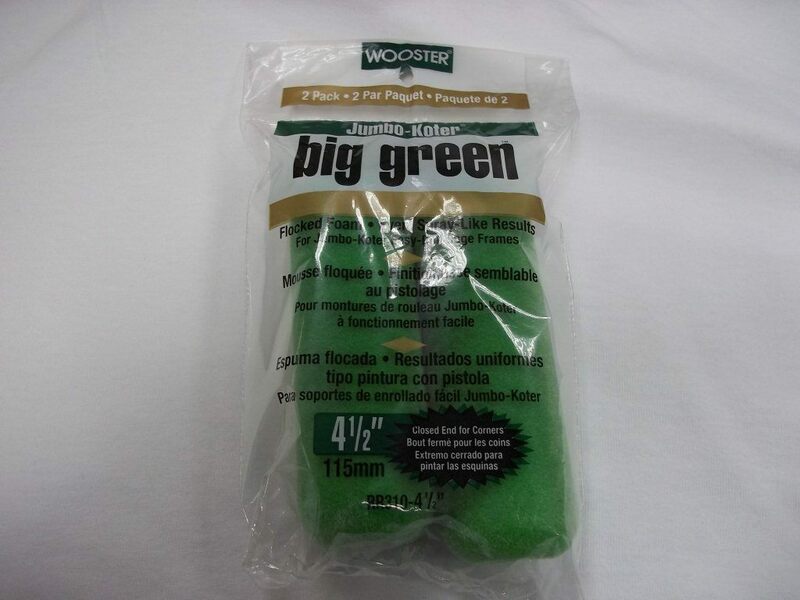 The Jumbo Koter mini roller comes in short and rad roller length. It takes both 4.5″ sleeves and 6.5″ sleeves. 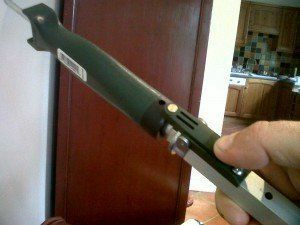 It has the same rigid barrel design as the big rollers, minus the snazzy quick release gizmo.. The sleeve does not slide off in use. The frame does not flex. With the 14″ frame and the Jumbo Koter frame, you are equipped to paint any size room in a speedy manner. In ordinary use I cannot see why this frame would break, but apparently it has been failing recently. I must admit that when painting exterior brickwork, we broke 2, although still not sure how it could break so catastrophically. Maybe a batch of Friday pm frames? Anyway, mine were replaced FOC and a few uses later are still fine and until I am offered a better frame for mini Wooster sleeves, I will stick with the JK. Don’t stop with frames though, this is a roller system. It gets really interesting when you have the best sleeves and the best trays to go with your fancy Wooster roller frames and pole. Wooster make it easy for you to get a totally consistent finish whatever roller size combination you use. They have many sleeve types available in all different lengths (4.5″ to 9″ through to 18″.) This means that you can use a JumboKoter 4.5″ in tandem with a 14″ or even a monster 18″ roller, and both rollers will have exactly the same pile, so they produce exactly the same texture finish round the edges, round light switches, in the middle of the wall… patching in. This is a huge bonus in the quest for speed and quality control. How many times do you see painters with a cheapo medium pile mini roller going round light switches and narrow areas between door frames, then knocking the main areas out with a beautiful sheepskin? From an efficiency point of view, it is absolutely the correct use of roller frame sizes, but anyone with an eye for a finish, will see a difference in the texture between the two different pile roller sleeves. The availability of many sleeve types and sizes also opens up a whole new approach to sleeve selection. There is no excuse to make do! These are just a few options available seemingly for every surface, any contingency. 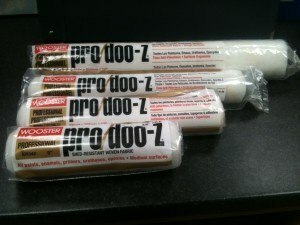 The pro doo-z mini sleeves will also lay acrylic paint very quickly on woodwork, where you lay off with a brush. 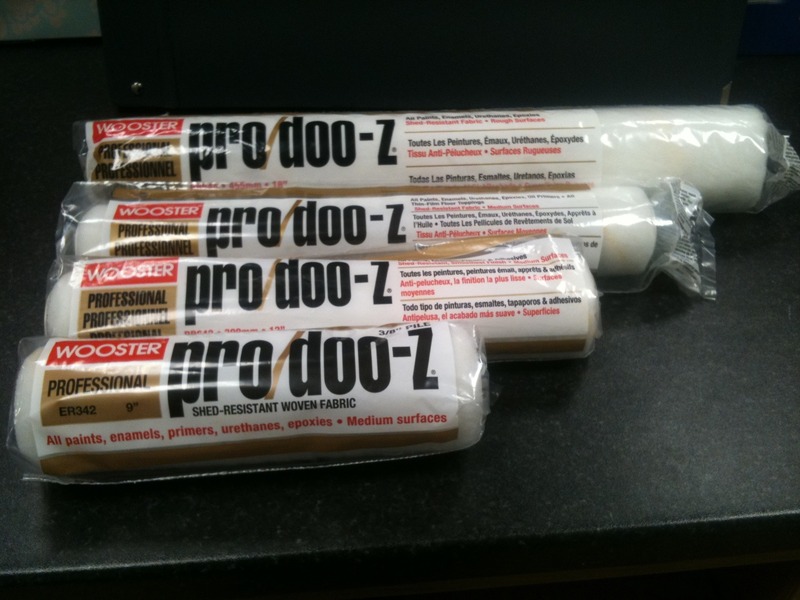 Even on ceilings or absorbent surfaces or slightly undulating plastered walls where you might think a deeper pile 1/2″ Pro Doo-z is better, don’t give up on the 3/8″ sleeve! It will load up with lots of paint, won’t skid, and when you back roll just before the paint starts to turn, it will leave hardly any orange peel effect. Poles have been taken to a whole new level by Wooster’s Sherlock GT quick release pole range. This is a system, not an after thought. The snazzy pole isn’t just about a neat look, it is an essential part of an efficient rollering technique. 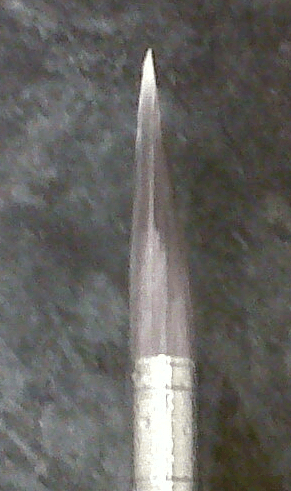 one to extend and retract the length. Wooster sell this pole on the premise that it is a once in a lifetime purchase. The build quality is outstanding and the weakest link, the quick release system, is wholly serviceable. Almost one year on, my pole still doesn’t look like it is going to collapse any time soon, but any quick release mechanism failures can be replaced for next to nothing. A pole for life – unlike my Wickes super duper (quite expensive) twist lock extendable fibreglass pole that seized solid within a couple of months, extended at 6 feet. The Jumbo Koter uses the same handle design as the bigger rollers. The poles come in different sizes, from 1-2ft (1′ closed to 2 feet fully extended) up to 16ft fully extended. 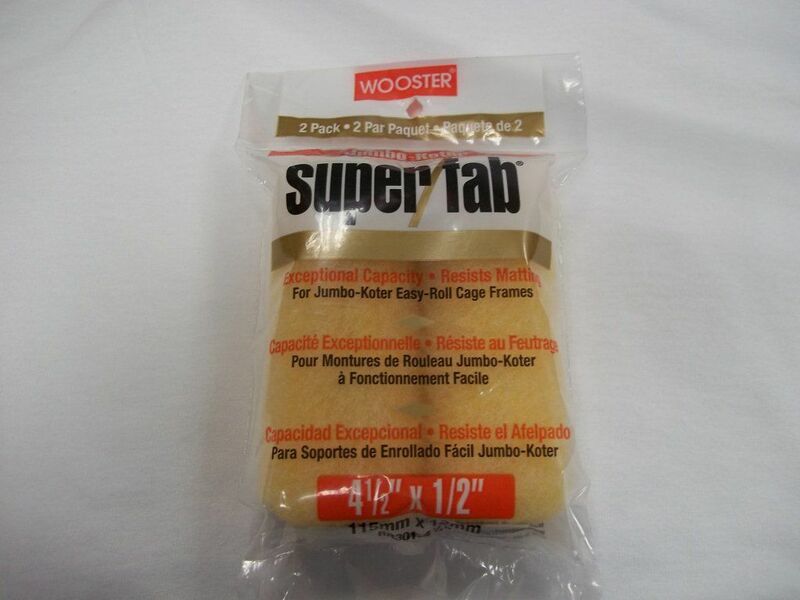 They don’t flex and are compatible with all Wooster roller frames, as well as assorted sanders and dust cleaners that need a pole extension. They even include a fitting in the handle if you insist on using a screw-in roller frame from another company. The 2′ pole is about right for small rooms, reaching the ceiling. Also with the Jumbo Koter that pole will speed up fiddly rolling too in confined spaces. This is my preferred cutting-in brush. It is light, keeps its shape, holds loads of paint, and I like how it creates a really skinny straight line. All of this is still true, except they aren’t readily available and for cutting in, are very slow compared to the following suggestions. The Wooster Silver Tip has stood the test of time and has great reviews; the Picasso and Rembrandt are outstanding for big production. If you find the right paint (acrylic lacquer especially) the Wooster Alpha is very efficient too. Lest we forget, Jack Pauhl’s 3″ Wooster Alpha demo for cutting in ceilings was the one that got the painters in the UK talking in a different league. I reviewed a 2.5″ Wooster semi oval, the massivo brush. I know a painter with big hands, he found it too big too. Brush preference / selection is a minefield, but as a rule of thumb, if you can perform the 2-stroke pass something like this, then you have the correct brush for cutting in a straight ceiling line. is now available from My Paint Brush. Like a lot of Wooster kit, at first sight you might think the Pelican paint kettle is a gadget, but once you start to use it, in the right situation, wow, what were we thinking before this came along? It has a magnet to hold the brush in place when you are rolling with the Jumbo Koter, and the roller hooks over the lip when you are brushing. 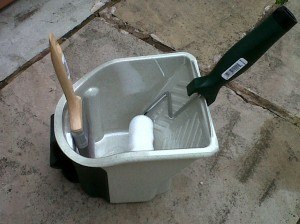 It has a liner for quick colour changes, and as long as you aren’t holding it for too long, the handle design works well. In the following scenario, the Pelican is a-mazing. a – cut in a section with your brush. 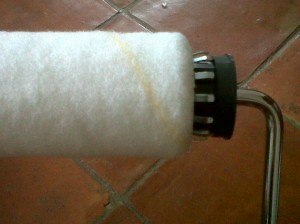 b – roll over the brush marks with a semi dry Jumbo Koter mini roller. 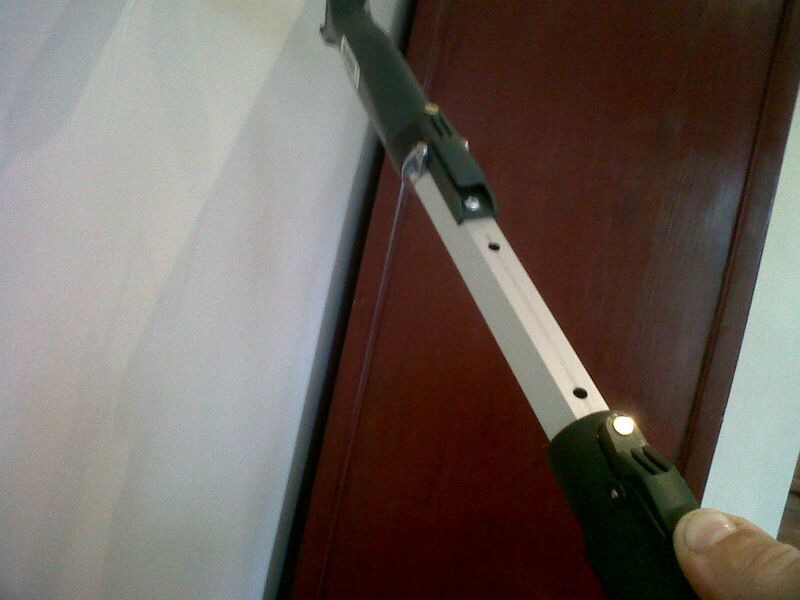 The Pelican is the tool of choice for efficient cutting-in and over-rolling round walls and ceilings. 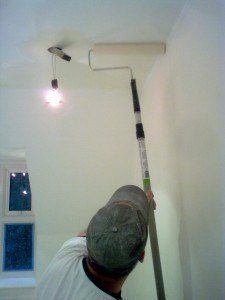 Also small ceilings, use the pelican and Jumbo Koter together with a pole, much simpler than setting up / cleaning a full size roller and tray. The Pelican however, is not so cool if you are painting window frames for example, with a brush only. ie If you use it like a conventional paint kettle it is not ergonomic, in that the handle doesn’t really work. A couple of decorators have talked about adding a conventional carry handle (rope or metal ), but I think it needs a swivel handle to keep the Pelican uncluttered when you are loading your brush and create a more natural grip. But maybe that is a mod too far. Wooster isn’t exactly new to the world, as the company has been trundling along in the USA for over 150 years, however in the UK only a relatively small (albeit growing) minority are using their kit daily. All I can say, is that for about £150, you can purchase the above tool kit and be on the way to a lifetime of high quality, high speed wall and ceiling painting. 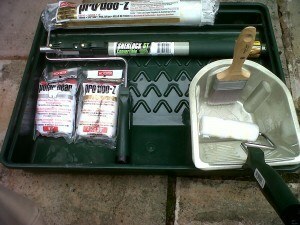 Totally agree with wooster reviews..been using all of above mentioned equipment for a while now..would urge anyone to arm themselves with this kit..simply on another level..I’ve never been the quickest decorator due to an obsession with perfection..but this gear has kicked me on.its brilliant end of. Hi, can yiu tell me where i can get all the wooster kit? 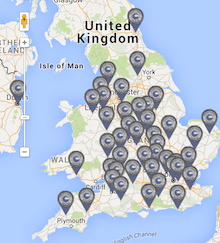 Every supplier i can find only has few bits in stock. Try here It all seems to be there under one roof.